Let's face it, if you own a childcare business designing and building a new daycare facility or school can be expensive and time consuming. This may be why more private operators, schools and churches are turning to used or new, custom designed modular daycare buildings and portable classrooms to solve space problems and meet enrollment demand in growing communities. "I've been buying new modular buildings for our chain of daycare centers in the U.S. and am really impressed with my choice of specifications and building options offered by the modular manufacturers. It seems like modular is now a better option then traditional building," stated one private daycare operator in Miami, Florida. "I initially used iModular.com for help. Matt Banes shared some really smart design ideas, site selection advice and helped me personally save time finding the most reliable manufacturer for our most popular 48' x 60' floor plan." 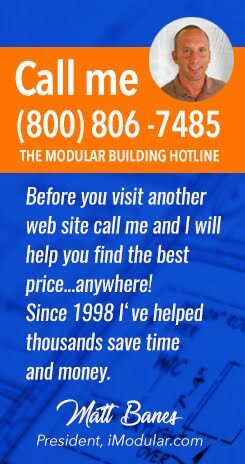 If you are in the planning stage for a new facility and would like to learn everything you need to know about using a modular building feel free to call me directly at (800) 806-7485 or start by completing my online modular building information and price request form. Major operators across the U.S. use new and used modular buildings to open new centers. If your budget won't permit a new modular building try shopping for a nice used model. Most modular building suppliers have classrooms that can be modified to meet daycare center needs and some suppliers have used daycare modulars available for rent or purchase.